Have you ever looked in your closet and thought, “wow that’s a mess! I really need to organize this better and get rid of that cheap wooden rod?” Well here are a few simple steps to getting your clothes organized in a closet. First of all, you have to call the right company for help. Consider the following: a good reputation, longevity, and of course a company that’s Canadian – not one of those branch plant infiltrators. Space Age Closets has been around for over thirty years and we are truly a Canadian company. Now that you’ve called Space Age Closets, you will be faced with some more challenges. 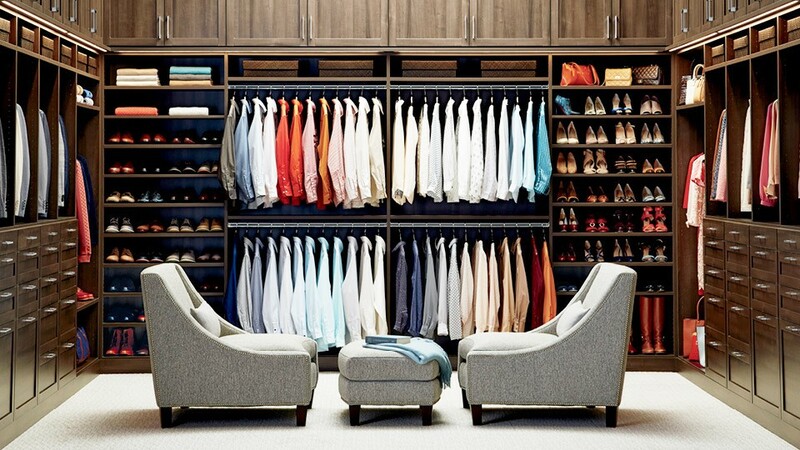 Take an inventory of what clothes you have. I’m sure there are a lot that you would love to keep and a few that really should go to a local charity. You’d be amazed how many shoes you really have and don’t wear. Something else to consider is perhaps condensing a few closets into one. The more you condense closets and convert them into a new storage varieties, you’ll start to realize how much more space you really have. You can put your boots all together in one space while keeping them separate from your sweaters. By separating clothing types, it’ll be much easier to see them all at once instead of searching for those favourite leopard heels amongst your winter sweaters. Once you have an idea of what you want to keep and where you’d like to put everything, one of our designers, will be coming over to your home to measure the closet space. Don’t worry about this aspect, we don’t judge if your bed is unmade (giggle). When our designer is visiting you, he will be asking questions about how many clothes you have and what variety so he can get a sense of what closet needs you have. 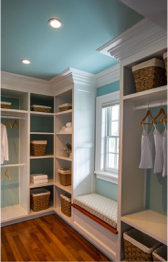 Measuring your existing space or spaces helps give us precision in creating custom storage that uses every square inch. Do you have a lot of purses? Perhaps you need shelving to suit that collection. Or are you a belt person? A simple rack can be installed to organize all of your belts as well. 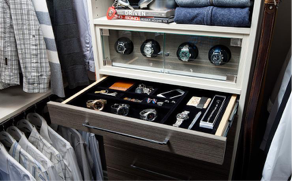 One of our favourite additions to a closet is a jewelry drawer, felt-lined and easily lockable if that is your desire. Now that we know what and how many clothes you have, it’s time to pick what colour, texture of the material used. White is quite popular. Chocolate pear and antique white wash are also great colours to consider. We have so many colours and textures to consider, not to mention that we have a huge assortment of glossy finishes. The big trend at the moment is white glossy – ever popular with the condo set. Now you’re probably thinking this is just a closet, but also consider: you use this every day, so why would you want something boring and blasé?